All of our products are available in a range of finishes, including veneered, white primed and fully finished. Quite often our customers ask us about the difference between the finishes, which is why we are creating a series of articles that take a closer look at each one. Today, we’re taking a closer look at our Veneered range, which refers to the type of finish a product such as veneered skirting boards have; a decorative layer of fine wood or wood alternative like MDF. As veneered products aren’t fully finished, they provide some flexibility in terms of decoration and you can often choose between glossing, staining or painting the product. We have a range of Veneered MDF products available, including skirting board, architrave and window sills, which can help you create your desired look. This looks great in any home as it can complement many different interiors. Finishing with gloss can enhance the fresh look of modern homes, whilst wax gives an understated yet classic look that’s perfect for traditional properties. Our American Black Walnut Veneered product is available in three profiles; torus, ogee and rounded one edge. View all Black Walnut Veneered. This looks amazing in modern homes and properties where there is plenty of light – especially when decorated with a high shine finish. Available in torus, ogee and rounded one edge. View all White Oak Veneered. Windows are a focal point of any home because they let light in, show off stunning views and give the impression of a larger space. – Our White Oak product works well in properties with plenty of windows that let in a high amount of light. The light colour of the product helps lift the room and adds a fresh new look. – Older properties and cottages can be enhanced by our Black Walnut product as the darker colour provides a refreshing yet classic look. It is often the little things that make a difference, which is why we have one Veneered Door Lining product available in White Oak and 10 sizes. Using a wax to finish your lining will complement your door, without having the dramatic impact often achieved with high gloss finishes. View all Veneered Door Lining. So there you have it, our Veneered range! 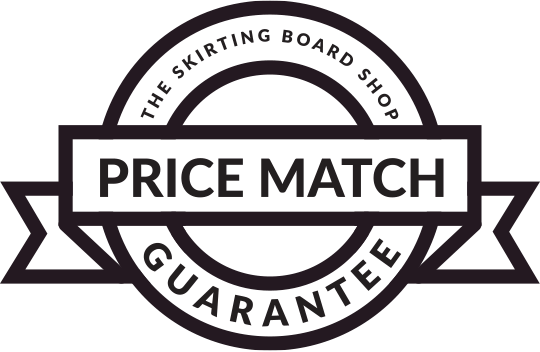 If you have any more questions, contact us today at help@theskirtingboardshop.co.uk or call us on 0800 048 0786.